Use of Drones Gains Traction in CERT Program; Is ARES Next? FEMA releases 2017 Hurricane After-Action Report. From its introduction: FEMA conducted an after-action review of the agency's preparations for, immediate response to, and initial recovery operations for hurricanes Harvey, Irma, and Maria. The 2017 Hurricane Season FEMA After-Action Report captures transformative insights from a historic hurricane season that will help the Agency, the emergency management community, and the nation chart the path into the future. Friedrichshafen Emergency Communications Gathering Hears Reports (7/13/18) -- IARU Region 1 Emergency Coordinator Greg Mossup, G0DUB, has posted a report on the Emergency Communications Meeting held at June's Ham Radio event in Friedrichshafen, Germany. Mossup said some 20 emergency communicators attended the June 1 meeting, sponsored by the IARU. Click on the link above for insight into emergency communications issues being addressed by Region 1 (Europe, Africa, northern Asia and Middle East) amateurs. 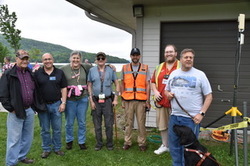 For the first time in the history of amateur communications support of Cooperstown, New York, area public events, high speed video and other data networking on the microwave bands were employed, implementing an AREDN mesh network in conjunction with the more traditional simplex VHF FM operations. 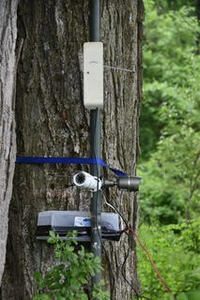 In the past, the Cooperstown Triathlon run that courses through picturesque Glimmerglass State Park has been supported by Otsego County ARES/RACES with traditional VHF ops, but this year the group added amateur high speed video, enabling remote monitoring of the wooded race course, providing an enhanced, significant situational awareness for race officials. With the leadership of John Rudolph, N2YP, of Unadilla, New York, and Brian Webster, N2KGC, of Cooperstown, a local area network was established to provide remote control and image transmission to and from remote TV cameras. The main net control station was set up at race headquarters, with the cameras placed at strategic sites around the race course.The real-time video was monitored by the race coordinators. The triathlon begins with an 800 meter swim in Otsego Lake, followed by an 18 mile bike ride and finishes with a three mile run, which takes place entirely within the borders of the park.This year's race was run on June 2, 2018. Along with the employment of the video system, the usual VHF FM portables were also deployed: A simplex frequency was used with backup of the 146.64 MHz Cooperstown repeater for the operators assisting officials with race participant and spectator safety. The video links were made possible using the Amateur Radio Emergency Data Network (AREDN) to set up the nodes used to control the cameras. Using AREDN the signal to noise ratio was so good that the images were clear and uninterrupted. Since the cameras were on the LAN, remote control of the cameras included full tilt and pan capabilities. The AREDN system can use amateur service bands in 900 MHz, 2.4 GHz, 3.4 GHz and 5 GHz spectrum. These nodes used AREDN 2.4 GHz channels just below the public accessible frequencies, but since they are amateur radio only channels, the lack of interference provides a low noise floor increasing the range of the small transmitters. The use of high-gain antennas at both ends helped with signal strengths, image quality, and hence, efficiency. Inexpensive Internet-protocol (IP) cameras were employed. The 5 GHz band was reserved as a backup, but its use was found to be unnecessary. The AREDN portion of the network build was simply the firmware uploaded to the Ubiquiti® 2.4 GHz radios. Since the radios are designed to work in frequency bands all over the world, the firmware can take advantage of the radio's ability to move to the amateur portions of the bands readily. This AREDN firmware is also not the standard Wi-Fi router software. It is designed to be part of a mesh system allowing new radios/users to get on the air once they have loaded the firmware and become a new node on the network. It's accomplished without the intervention of a network administrator, thus the system is well suited for this type of ad hoc, flexible and simple communications networking. Switches running on 12 volt batteries were set up at each node and the radios ran on 24 volt power supplies. The entire site installation assembly -- TV camera, switch and 2.4 GHz radios -- were easily portable and could be connected to the network at any point. The race/park terrain was favorable, allowing for a simple camera support. The nodes maintained a 60 Mbps link speed for the duration of the race. Even though two remote sites did not have their main antenna patterns aimed to connect to each other, they were still able to mesh together, but at a much lower throughput speed of about 6 Mbps. see other portions of the courses. The system software also allowed for monitoring of the signals and signal-to-noise ratios for each path. Race organizers were pleased with the ability to observe distant portions of the race course in real time. Glimmerglass State Park has many remote, unpopulated wooded trails, and the video system provided good coverage of the runners and spectators. The use of the video network also relieved to some extent the necessity for traditional VHF-equipped operators at all remote sites on the race course. (VHF radio-equipped ARES/RACES operators were still stationed at critical points on the course in the event of the need for emergency voice/tactical communications). Ridgefield is a small town in southwestern Connecticut, and faces common hazards such as hurricanes, thunderstorms, blizzards, and the flooding that often follows. Ridgefield has an active Community Emergency Response Team (CERT), prepared to meet these challenges, and has stepped up its game recently with its use of drones to collect information for responders on the ground. The Emergency Manager and CERT Coordinator had a successful first deployment during a recent major thunderstorm. The team has trained over 150 residents in preparedness and disaster response. Of these, 40 members belong to the Incident Management Team (IMT), meaning they have received additional, specialized training to support Ridgefield's Emergency Operations Center (EOC). IMT members, including radio amateurs, are trained in skills such as public information, damage assessment, logistics, sheltering, and Amateur Radio operation. Ridgefield's team used drones to perform damage assessment -- they give a bird's eye view, which provides a much better picture of the scope of damage than a ground-level survey. For example, several trees, power poles and lines could come down on a twisting road, with emergency responders having no idea what's happening beyond the first fallen tree. The drones help the team see conditions beyond the tangled mass of trees and wires and report to responders on the ground. Drones were first tested when Ridgefield was hit by a storm with winds as high as 135 MPH. The information collected was then shared with the local power company so that utility crews could better respond to power outages. The drones succeeded in giving CERT members, and the power company a peek beyond major road blockages. The National Weather Service was also able to make use of the drone footage for its own assessments. This course provides an overview of NIMS, which defines the comprehensive approach guiding the whole community - all levels of government, nongovernmental organizations (NGOs), and the private sector - to work together seamlessly to prevent, protect against, mitigate, respond to, and recover from the effects of incidents. The course provides learners with a basic understanding of NIMS concepts, principles, and components. Together, these two online courses form the foundation of ICS/NIMS training for all incident personnel. Note that IS-100.c and IS-700.b are updated versions of the IS-100.b and IS-700.a courses. If you have successfully completed a previous version of these courses there is no FEMA requirement to take the revised versions of the courses. However, because these courses contain new information based on the revised NIMS, October 2017, you may find it informative to review the new versions of these courses. The new courses will be available through FEMA's EMI website. 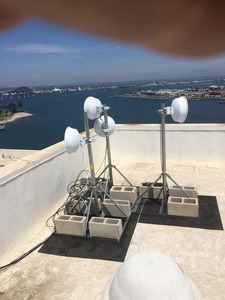 The Coronado, California, Police Department worked with the Coronado Emergency Radio Operators (CERO) to set up high resolution remote control cameras on the CERO microwave network to enhance public safety during the city's annual Independence Day Parade. These cameras and operators were also helpful in remote monitoring of the many associated events of the day, culminating with the closing fireworks show over San Diego Bay. 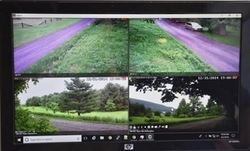 Marc Langlais of the Police Department contacted CERO President RB Smith, WW6RB, and indicated that the cameras would aid the department in monitoring for possible incidents, and contributing to response efficiency and effectiveness. five cameras, and two roof mounted cameras with views from the parade staging area to its end at the official parade viewing stand and at key intersections in between. region. The network has been used in San Diego County Hospital Drills as well as being employed during Field Days and other special events. Learn more on making Powerpole connections, soldering, building dual band J-Pole antennas and other technical topics of special interest to public service operators. Click here. Learn more on current digital modes used for incident and event communications and operating here. Click here for information and learning how the FCC Part 97 amateur service rules apply to emergency communications, RACES and drills. It's important for all active ARES operators to be familiar with the now ubiquitous forms used under the Incident Command System during incidents and events. A great page from FEMA's website lists and has PDF (downloadable, and fillable) files of all ICS Forms. An ICS Forms Booklet is also available. As an example of use, in the ARRL South Texas Section, all Emergency Coordinators are asked to complete an ICS-217A form for their respective county's radio assets. Click here for further information from South Texas. On Saturday, May 19, 2018, Sonya Andron, Section Manager of Operation and Preparedness within the Oregon Office of Emergency Management (OEM) addressed the annual leadership meeting of the Oregon ARES. The event was held at the Sisters-Camp Sherman Fire Station Conference Facility in Sisters, Oregon. Andron spoke on the role of ARES as it relates to Emergency Services in Oregon. County officials attending the meeting included Jamie Poole, the Outreach and Technology Coordinator for Clackamas County Disaster Management, who spoke on Emergency Management/ARES relationship building, and Sara Rubrecht, representing Josephine County Emergency Management. Also attending was Ken Kurth, the Emergency Coordinator with the Oregon State Communications Unit in Salem. Assistant Section Emergency Coordinator (ASEC) Tom Sharp, K7COW, of Burns, Oregon, moderated the event. In attendance were Oregon ARRL Section Manager John Core, KX7YT, and District and county Emergency Coordinators representing the six ARES Districts and 36 Oregon counties. One quick comment on your recent LED lighting article. I have several of the LED headlights that my wife picked up for me, but I dislike them for one reason: They all take 3 AAA batteries. The lights last only a few hours on a set of AAA batteries. I don't buy any flashlights or other devices that require more than micro-amps of current that use AAA batteries. My favorite LED flashlight uses two CR123A lithium batteries.The flashlight was relatively costly on-line, but the batteries are quite inexpensive at various places on the Internet (less than $1.50 at Digi-Key, for example).The flashlight is less than 5" long and 1" in diameter--it fits easily in a pants pocket. It is quite bright, and the batteries last a long time. Caribbean Emergency and Weather Net - Meets daily at 1030Z and 2230Z on 3815 kHz. The Caribbean Emergency and Weather Net was established in 1958 by Colonel Henry Frew, KV4BZ, for the purpose of having a general calling frequency for the Caribbean Islands and their North and South American friends. The net's original name was the Antilles Emergency Net. Hurricane Watch Net -- 14.325 MHz (day)/7.268 MHz (night). Activated whenever a hurricane is within 300 statute miles of expected land-fall. Disseminates storm information and relays meteorological data to National Hurricane Center via embedded NHC station WX4NHC. Also relays post-storm damage reports and other relevant information. Intercontinental Net -- 7 AM to noon US Eastern Time - 14.300 MHz. Provides a means of emergency communications to any location where the normal means are disrupted by local disaster such as fire, earthquake, storms, floods and terrorist activity. Maritime Mobile Service Net -- 12 PM to 9 PM US EST or 12 PM to 10 PM EDT - 14.300 MHz - The network acts as a weather beacon for ships during periods of severe weather and regularly repeats high seas and tropical weather warnings and bulletins from the National Weather Service and the National Hurricane Center. 14.300 MHz Net Information - More information about nets on 14.300 MHz. Salvation Army Team Emergency Radio Network (SATERN) - 14.265 MHz - The purpose of the SATERN net is to support the Salvation Army operations in local, regional and international disaster situations, as well as other functions. VOiP SKYWARN/Hurricane Net -- A weekly Prep Net is held on Sundays at 0000 UTC, which is Saturday evenings for most of North America. Join by connecting to the EchoLink WX-TALK conference server, IRLP Reflector 9219 or if necessary to one of the backup systems. Monitor the net during hurricanes and other major severe weather events. On June 7, 2018, Jim Piper, RN, N6MED, Volunteer Disaster Health Services Liaison to Amateur Radio for the American Red Cross, Gold Country Region in California, presented a program entitled "Disaster Communications and the Amateur Radio/ARES Community" at the Salvation Army center in Concord. Piper gave an overview of the functions of the American Red Cross in responding to a disaster, going beyond the typical public perceptions of what it is that they do. He described what kinds of message traffic they need to move if the telecom infrastructure is impacted and their approach to that problem in the Gold Country Region. Piper also discussed what they ask of the Amateur Radio community to help them move messages from origin to destination. On June 27, ARRL Southern Florida Section Manager Jeff Beals, WA4AW, received a call from Lt. Lopez of the United States Coast Guard (USCG) in Miami requesting assistance when their Channel 16 monitoring network went down in Broward, Palm Beach, Martin and St. Lucie counties. Assistant Section Emergency Coordinator Barry Porter, KB1PA, immediately contacted Emergency Coordinators in those counties to activate ARES members near the coast to monitor Channel 16 (156.800 MHz) for possible distress calls. Operators were requested to call any emergencies in via landline to USCG Miami. "Response was quick as we had ARES members in these counties in service within 30 minutes from the call," said Beals. "Lt. Lopez requested us to stand down later that day when they were able to rally their USCG Auxiliary communication teams along the coast into service." [Jeff Beals WA4AW, in addition to serving as Section Manager, is also a Southeastern Division Assistant Director].